Clark Howard came to talk about his Tesla Model S. He was surrounded by a crowd for most of the 4-hour event, as were all the Tesla owners. There was lots of traffic for the other EVs as well. We had a variety of new production plug-ins plus some older models like the original Rav4 EV and the Sparrow. We also had conversion projects. The location in a downtown shopping mall was a bit tight, so we had a secondary location at a Charging Spot in the Mall Parking lot. A DC fast charger donated by Nissan has been installed here but recent rains prevented energizing it in time for the event. The Tesla Sales Center ran Test Drives throughout the afternoon. Plans are complete to host the event at Atlantic Station in the Central Park area of the complex. 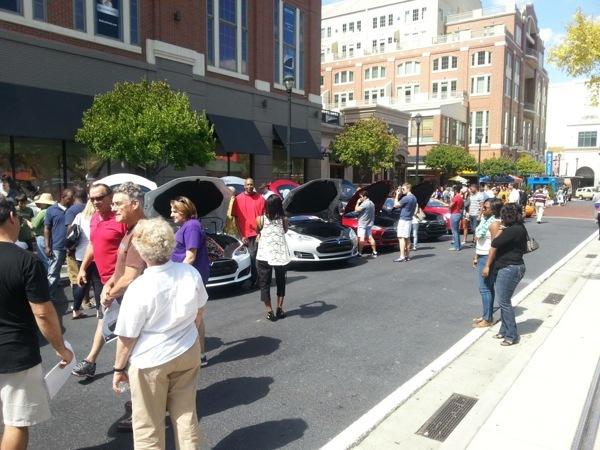 Atlantic Station will be closing down both East and West District Avenues between 18th and 19th Street for the display of plug-in vehicles. The event will run from 1:00 to 5:00 pm on Saturday, September 28, 2013. We are limited to about 30 cars in the area reserved for us. Depending on the make, model and year of vehicle you are bringing, you will receive instructions to approach East District Avenue from 18th Street or West District Avenue from 19th Street. Both streets are accessible from Market Street which should be entered from 17th Street whether coming from the east off the connector or from west off Northside Drive. The EVCS NPID team is now picking the vehicles that will be displayed in this area. We will have overflow parking and display in the parking lot next to the Charging Spot at the corner of 17th Street and State Street. Parking lot entrance is on 18th Street just west of State Street and across from the Target Store. Along with Nissan NA, EVCS will be hosting a PEV Corral in the parking lot next to the Charging Spot at Atlantic Station. As we get closer to the event, We will also be celebrating the first public DCFC unit at the Atlantic Station Charging Spot that day. Nissan will have special NPID T-Shirts and water bottles at their booth in the Central Park area. We have been asked to push back the start of the event to 1:00 pm with set up to start at noon. We will need for all participants to come first to the parking lot behind the Charging Spot first. Entrance to the parking lot is at the corner of 18th Street and State Street. Once the Alzheimer Walk activity is clear of the Central Park area, we will send the vehicles selected for display over to Central Park in a group. Please contact James Nolan if you want to display your vehicle. Be aware that the vehicle must stay in the area until 5:00 pm when we will break down the event and we have a limited number of spaces available. We have more than 100 parking spaces in the parking lot next to the Charging Spot, lets fill the place up. Personnel from Lanier Parking and volunteers from the EV Club of the South will be present to help get everyone in the correct location. There are currently 243 attendees registered.